Australia is one of the world's driest inhabited continents. Every organisation involved in constructing hardscapes or landscaping has the responsibility for preventing or reducing water pollution. We must also protect and conserve our part of the planet's less than 3 percent fresh water. Naturally, water is not always pure and clear. In lakes and running waterways it takes on a murky quality when decaying organic material is introduced or sediment is stirred up. In urban settings, water runoff picks up natural, and man-made pollutants. These are carried off to contaminate our only pure water sources. With clever landscaping features such as porous paving, we can add to the solution for water preservation. Plan for areas where water can be conserved. When planning a landscape design, start by walking the property and noting areas that collect water in puddles or where it overflows into ditches or drains. These places are ideal recipients for porous paving features. In those areas, you can establish walkways, seating areas with focal points or patio sections. With porous paving, rather than forming puddles which eventually evaporate or draining away from the property, the water is absorbed into the soil. 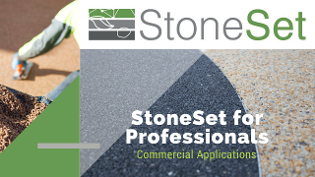 StoneSet is ideal as a paved surface. Even though it is constructed with crushed or decorative stone bound together, it contains tiny openings that allow water to drip through. As the water absorbs into the soil, it provides moisture for nearby plant life. To an extent, pollutants such as fertilisers, sediments, microorganisms from animal droppings and motor oil are filtered out before it reaches the groundwater supply. Porous paving surfaces work for commercial applications. Contact us today for assistance with your commercial landscape design. Be part of the solution for a healthier, greener Australia.